We spent a pleasant and exciting morning at Whistler yesterday. Today's mission: take a dogsled tour with a local tour company. Lots of fun and boy do you go fast on the downhill runs. Not so quick on the uphills in the slushy snow. Good thing the guide suggested that I (Evan) get out and push a bit up the hills. 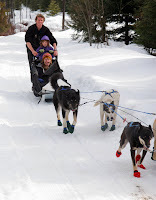 We all got a chance to mush the dogs. Highly recommended but stick to middle of winter when the snow is a bit firmer. She said it was lots of fun too. Maia is off to Bike camp this Spring Break.